This past weekend I had the privilege of working The Compassion Experience in Glendale, Arizona (a suburb of Phoenix). If you have never heard of Compassion International you should check them out. They are doing incredible things to release children from poverty around the world (shameless plug). It was a whirlwind of a weekend, but I never turn down an opportunity to travel and I had never been to Arizona before. If you have read this blog before, you know I like to try new burgers when I travel. I’ve decided there must be something about the west — maybe it’s the dry air or those beautiful mountains — but the west makes me crave burgers. All the burgers. I ended up eating 3 burgers in a 24 hour period. Am I ashamed? Nah. Two of those burgers were from In-N-Out because…well, do I really need to explain myself here? The other burger was from a place called Tru Burger Co.
Tru Burger Co. prides themselves in using only antibiotic and hormone free meats. They have several unique burgers to choose from. I decided to go with the PB&J burger. I’ve been wanting to try peanut butter on a burger for a while now, and the bacon-jalapeno jam sounded intriguing. I paired my burger with the garlic parm fries. The burger was…good. 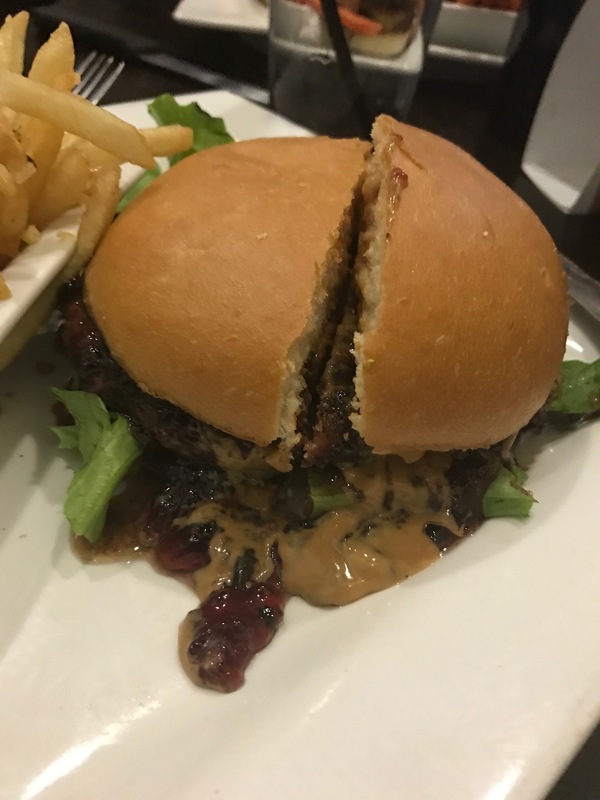 I really liked the mix of the sweet peanut butter mixed with the spicy savory jam on a burger. It was a lot of unique flavors mixed together, and they complimented each other well. The patty itself left something to be desired. It didn’t have much flavor and was even a little bit dry. I ordered my burger medium and it was served medium-well. I just wish the patty had more flavor because this burger had the potential to be outstanding. I really enjoyed the fries! They had a lot of flavor and were nice and thin shoestring fries. So will I dream about this burger? Probably not. Would I go back to Tru Burger? Maybe. But it satisfied the craving, and I will definitely try peanut butter on a burger again. Does anyone else have a burger suggestion for the next time i’m in the Phoenix area?